View Part 1 of the Science of Pain series here. Clients suffering from chronic pain are confronted with a unique disorder—a personal experience unlike other physical problems such as a broken leg or an infection. Everyone knows that a broken leg can be confirmed by X-ray. An infection is detected using simple tests measuring white blood cell count. Regrettably, there is no universally reliable test to measure pain levels, causing many common musculoskeletal complaints to be mis-assessed, improperly treated, or simply ignored and ambiguously tossed into classifications such as acute, subacute, recurrent, and chronic. Figure 1: Gerber’s : lift-off Test for possible subscapularis injury. Since multiple strain patterns typically exist in chronic injuries (particularly shoulder injuries, it makes sense to establish length/tension/postural balance before chasing pain. Courtesy of Erik Dalton. 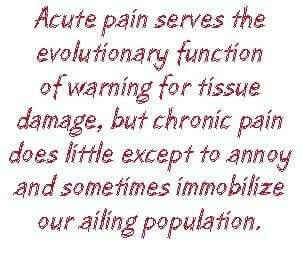 Acute pain serves the evolutionary function of warning for tissue damage, but chronic pain does little except to annoy and sometimes immobilize our ailing population. Of the estimated fifty million sufferers in the United States, more than half receive no medical relief and many may never be given a diagnosis. Part two of the “Pain Game” opens with a brief history of popular pain theories and follows with recent findings and treatment options for correcting pain-ridden clients seen daily in the manual therapy workplace. The goal is to shed new light on a much-researched, but sometimes misunderstood phenomenon. René Descartes of the “I think, therefore I am” fame, introduced one of the original pain theories in 1664. His practical model proposed a simplified system detailing how pain messages were transmitted directly from pain receptors in the skin to a pain center in the brain. He compared it to a bell-ringing mechanism in a church tower pulled by a rope at the tower’s lower chambers so the bell rings throughout the landscape. Descartes believed there is a one-to-one relationship between tissue injury and the amount of pain a person experiences. Think about it. If you stick your finger with a needle, you would experience minimal pain; whereas, if you cut your hand with a knife, much more pain would be felt. Thus, the specificity theory proposes that the intensity of pain is directly related to the amount of tissue injury. The specificity theory was modified throughout the nineteenth and early twentieth centuries, but the basic assumptions remained the same. Descartes’ specificity theory has generally proven to be accurate for acute pain, but falls short when applied to many types of chronic pain. Regrettably, variations on the specificity theory are still taught (or at least emphasized) in many medical schools, and a majority of doctors still ascribe to it in practice. The theory assumes that if surgery or medication can eliminate the alleged cause of the pain, then the pain will disappear. In chronic pain cases, particularly of musculoskeletal origin, this is often not true. If a doctor continues to apply the specificity theory to a chronic pain problem, the patient may be at risk for surgeries, medications, and procedures that may not work as the search for the source of the pain presses forward. Ultimately, the validity of the patient’s pain complaints will be challenged if reasons cannot be found and the treatments do not work. This can often lead to the familiar “it’s all in your head” diagnosis. One of many findings that has led to the downfall of the specificity theory was that of phantom limb pain. Often, patients who have undergone limb amputation continue to report sensations that seem to emanate from the missing limb. Some report that the limb feels as if it is still there while others actually feel pain in the area of the missing body part. Of course, these sensations cannot be coming from the limb since it has been removed from the person’s body. The specificity theory cannot account for these findings since there is no ongoing tissue injury in the amputated limb. The specificity theory also cannot explain how hypnosis can be used for anesthesia during surgery. Certain people under hypnosis can withstand high levels of pain that would normally cause them to cry out. Surgery has been done on almost every part of the body using only hypnosis for anesthesia. Obviously, significant tissue damage is occurring during the surgery but the patient under hypnosis is experiencing no pain. This finding dealt the specificity theory a significant blow. Ronald Melzack and Patrick Wall’s popular neurological discovery introduced in the mid-sixties has been instrumental in helping understand the intimate relationship between nociception and mechanoreception as discussed in part one of this series. Two unlikely researchers—one a psychologist, the other a physicist—conceptualized a pain conduction model that has generally been embraced throughout the medical and manual therapy communities, even though the exact underlying neurobiological mechanism detailing how the gate theory works is still in question. Melzack and Wall’s gate control theory1 suggested that when body tissues are damaged, messages carrying information about the injury travel toward the brain along two separate sets of nerve fibers. The larger (mechanoreceptive) fibers transport messages about sensations other than pain (joint movement, heat, touch, etc. 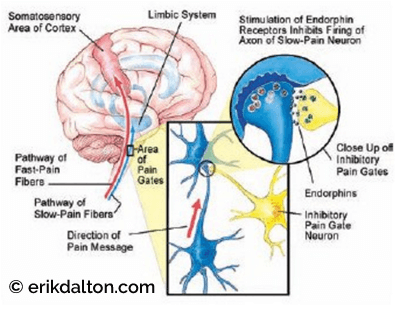 ), and the smaller (nociceptive) fibers carry the pain signals. The messages that travel along the larger fibers tend to arrive at the spinal cord before the messages traveling along smaller fibers. Therefore, as long as the large-diameter channels are adequately filled with normal non-painful sensations, the smaller pain-generating messengers are crowded out, unable to get through to the brain (see Figure 2). Problems arise when normal mechanoreceptive input is disrupted, allowing increased nociceptive transmission. According to Melzack, “Pain messages flowing along peripheral nerves to the spinal cord on their way to the brain encounter ‘nerve gates’ that can inhibit (close) or facilitate (open) the incoming nerve impulses.” 2 However, if pain signals are allowed to reach the brain, a number of different things can happen. Certain parts of the brain stem can inhibit or muffle the incoming messages by the production of endorphins, a naturally occurring morphine-like substance (see Figure 3). Stress, excitement, and vigorous exercise are among the things that stimulate the production of endorphins. This is why athletes may not notice the pain of a fairly serious injury until the big game is over. Additionally, this explains why regular aerobic exercise can be an excellent method to help control chronic pain. 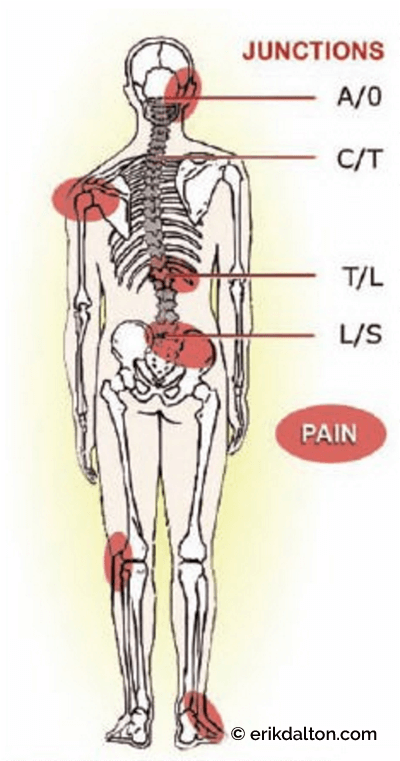 Figure 3: Pain gating does not necessarily occur at the site of injury. The brain stem can inhibit or muffle low-priority, incoming pain messages (burn knee) by the production of endorphins. Adapted by Bill Allen with permission. Once the gate control theory had been accepted, it was possible to explain all sorts of natural phenomena that up until then had been a mystery. It becomes clear, for example, that when we rub a sore spot we are increasing the number of non-pain messages traveling toward the spinal cord and brain. If you bang an elbow against a door, you automatically reach to rub the spot knowing (subconsciously) the pressure of rubbing decreases the amount of pain experienced. Apply a clothespin to one arm. Initially the pressure will produce pain that may be quite intense as the skin and surface muscles are compressed. Peripheral nerve fibers detect this pressure and transmit a pain signal to the spinal cord and on to the brain. At first, it is the nociceptive fast pain signals that get through, and the intensity of the pain experience is fairly proportional to the amount of pressure applied. Everyone could agree this is acute pain. The slower pain signals are not far behind, however, and a dull ache may soon be noticed. After a short while, most people will notice a reduction in the pain coming from the pinched tissue as the spinal nerve gates close. This downgrading occurs as the brain begins to view the pain signals as non-harmful, i.e., the pressure may be painful initially but is not incapacitating. As time goes on, the brain gives the pain message less priority and awareness decreases greatly. The brain knows the clothespin is not causing any injury. Therefore, the thalamus and cerebral cortex gradually begin turning down the volume to the point where it is barely noticeable after about thirty minutes. Although skin and muscle compression is still occurring, it is now perceived as a mild discomfort, if noticed at all. Explaining the basics of this theory to clients can help establish the credibility of hands-on, pain-management interventions. It will also actively demonstrate that changing the way one mentally perceives pain can actually change (decrease) the experience of pain on a physiological level. A groundbreaking new study underway at Stanford University’s Neuroimaging and Pain Lab reinforces this assumption that people can indeed alter the way they experience pain. Using cutting-edge technology, lead researcher Sean Mackey, PhD, allows subjects to visually observe their own brain activity while exposed to painful stimuli. The intent is to see if subjects are able to consciously reorganize brain pathways to control their pain. A futuristic real-time imaging device allows participants to assess how well they are able to increase and decrease pain by watching the activation of cerebral areas involved in chronic pain. This newest form of M.R.I. called functional magnetic resonance imaging (f.M.R.I. ), used in combination with sophisticated state-of-the-art software, allows chronic pain sufferers to mentally take movies of their cerebral activity and redirect the pain messages to non-painful cortical areas. Mackey’s biofeedback-type experiment may soon help chronic pain sufferers learn to abolish pain by controlling their brains. Many clients presenting with muscle/joint pain could be actively experiencing the gating process. Prolonged sitting while holding a telephone with one shoulder can jam (and lock) cervical and thoracic facet joints closed on the ipsilateral side or open on the overstretched side creating alterations in normal mechanoreceptive cerebral input (see Figure 4). As the larger fibers begin to break down, the small unmyelinated free nerve endings (nociceptors) are able to sneak through and fast track noxious signals to the brain, warning of possible tissue damage from the motion-restricted joints. Mechanical deformation and accompanying inflammation ignite nociceptive activity (due to strain) in the following spine-related tissues: transversospinalis muscles; overstretched spinal ligaments and joint capsules; and compressed facet joint cartilages and intervertebral discs. Figure 4: Facet joints (right) lock closed during prolonged right cervical side bending. Note the reflex spasm in the intertransversarii muscle. Adapted from the Tom Bowman with permission. Continuous neural bombardment eventually triggers stubborn reflexes that amplify musculoskeletal tone (protective muscle guarding), distort posture (functional scoliosis), and up-regulate sympathetic nervous system activity (anxiety). Regrettably, the brain has the ability to relearn these aberrant patterns as normal. Neuroscientists label this condition— where distorted postures remain in the body long after the original stimulus has been removed—as spinal learning, reflex entrainment, and neuroplasticity. Although therapists commonly encounter these chronically crooked bodies, we often settle for immediate symptom alleviation rather that digging for the root of the problem. As the great Czech researcher Vladimir Janda, MD, once said: “The neuromusculoskeletal system must be assessed and treated as a whole, with muscle dysfunction considered in relation to the functional status of the whole motor system, including articular and nerve structures. Any change in the statics or dynamics of the distal trunk and lower extremities will, in some way, be mirrored in the function of the upper complex, and vice-versa.”4 Despite the variety of pain-management approaches available in today’s ever-expanding bodywork field, the therapeutic goal should remain the same: Restoration of maximal pain-free movement within postural balance. One of the most frustrating and elusive conditions encountered by all somatic therapists today is lumbo-pelvic pain due to our population’s growing flexion-addiction. Prolonged sitting and sleeping in flexed positions promotes length-tension imbalances often resulting in tight/short hip flexors and neurologically weakened hip extensors. Davis’ Law reminds us that when contractile tissues are placed in a slackened position for extended periods of time, the muscle’s tonus is taken up. 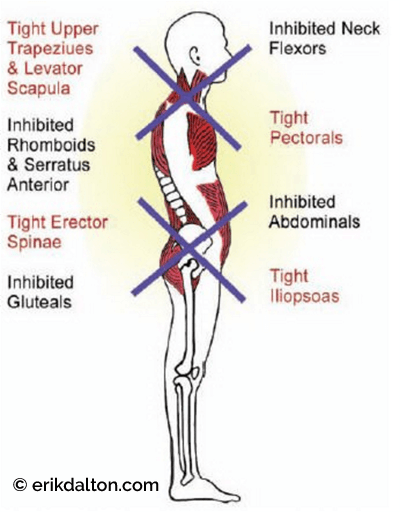 As prolonged flexed sitting and sleeping shortens the iliopsoas and rectus femoris muscles, lumbar lordosis increases, excessive weight is transferred to the posterior facet joints, spinal ligaments are strained, and ultimately intervertebral discs begin to degrade. This massive group of average American workers and couch potatoes are labeled by myoskeletal therapists as flexaholics. All somatic practitioners (massage, Pilates, yoga, personal trainers, etc.) must join forces to reverse our society’s destructive trend toward flexion- addiction. Developing successful hands-on, flexion- addiction corrections typically begins by balancing tonic and phasic muscle groups using practical postural assessment models such as Janda’s famous upper and lower crossed syndromes (see Figure 5). Once balance and symmetry has been established in the sagittal plane, therapists often notice a reduction in side-to-side (scoliotic) torsional patterns, but not always. Leg length discrepancies, cranial and sacral base unleveling, and genetic or traumatically-induced structural disorders often produce stubborn asymmetrical compensations at key crossover junctions (atlantooccipital, cervicothoracic, thoracolumbar, and lumbosacral) (see Figure 6). Figure 5: V. Janda’s upper and lower crossed syndromes. Mediclip, Lippincott & Wilkins, 2005 with permission. Figure 6: Foot hyperpronation shortens the leg, causing painful postural compensations detailed in highlighted areas. Courtesy of Erik Dalton. If the compensatory scoliotic adaptations are functional (fixable) and not structural (fixed), therapists should incorporate specific gating maneuvers to help release the reflexogenic muscle spasm resulting from loss of joint-play. The key is to develop a gating maneuver that safely coactivates and normalizes function in all four types of joint, ligament, and paravertebral muscle mechanoreceptors. As normal mechanoreceptive flow to the cord and brain returns, pain is gated, muscle guarding diminishes, posture improves, and clients revel in their new-found flexibility and pain-free bodies. But how is this accomplished? Traditional relaxation massage of a peripheral pain site temporarily calms cutaneous skin and fascial receptors, reducing local superficial pain (see Figure 7). But to alleviate deep-seated, joint-complex pain, the client must be actively involved. For example, as the therapist holds specific directional sustained pressure to motion-restricted joint capsules, spinal ligaments, and deep transversospinalis muscles in the upper thoracic lamina groove, the client is asked to engage the restricted area by adding movement. Enhancers such as chin tucking, arm rotations, head sidebending, or pelvic tilting are but a few examples, but be creative (see Figure 8). Designed to Experience Joint Pain? Since there is less nociceptive innervation of the muscular system than other joint-related tissues, today’s manual therapist must begin thinking outside the traditional muscle-pain, tender-point, fibromyalgia box to include soft-tissue techniques for breaking reflexogenic pain/spasm/pain cycles caused by the loss of joint-play. Recall that all the body’s synovial joints (spine included) must have at least one-eighth inch of movement not controlled by muscle contraction.5 The facets are said to be idling. This built-in cartilage protective mechanism serves as an instrumental neurologic key for abolishing abnormal reflexes that perpetuate muscle guarding, leading to destructive pain/spasm/pain cycles. Compared with nociceptors, significantly fewer mechanoreceptive afferents leave joints. The predominant receptor is the nociceptor—especially in context that more than 90 percent of joint innervation is nociceptive. These theories were originally determined by animal studies,6 then subsequently confirmed in studies with human spinal joint capsules.7 This heavy concentration of nociceptive fibers in joints suggests humans are basically built to experience joint pain when considering how many people suffer joint-related neck and back pain during their lifetime. The vicious decompensation cycle must be stopped before the onset of more serious degenerative conditions such as osteoarthritis, dowager’s humps, spondylolisthesis, and radiculopathies. To achieve a noticeable reduction of increased excitability in the neuronal pool, the pain-generating stimulus must be interrupted until the memory burned into the nerve cells has been completely forgotten. For many chronic pain cases, a serial-type, deeptissue therapy works best where clients are seen twice weekly until hyperexcited receptors feeding the central nervous system are quieted. This will eventually inhibit the chemical activation of pain at the site of its peripheral stimulation. Therapists should expect positive clinical results to improve with each myoskeletal alignment session due to increased mechanoreceptive activation and less joint complex nociception. But successful management of chronic pain depends on much more than intellectual knowledge. It must be teamed with keen observation skills, patience, compassion, and a constant reminder that the healer is ultimately within each client. Therapists serve only as helpful facilitators in the ongoing journey toward optimum health and should gratefully utilize the body’s innate self-regulatory system to help guide the therapeutic process. The myoskeletal joint receptor concept attempts to override the idea that pain is primarily a consequence of conditions such as pinched nerves that could ultimately be freed by removing bony obstructions. Although spinal nerves travel through small intervertebral foraminal openings, rarely does a bone-on-nerve dysfunction occur. Significant facet hypertrophy, disc collapse, or intraneural edema must accompany the vertebral misalignment before the client experiences pain. While commonly associated with the spine, pinched nerve compressive lesions are actually rare. Researchers suggest that only 10–15 percent of spine related problems are caused by direct pressure of bone on nerve tissue. Clients with this type of nerve occlusion usually report numbness, burning, or a pins and needles feeling. More frequently, nerve roots become agitated from prolonged exposure to chemical or mechanical irritation. This condition develops slowly as the nerve’s dural sheath is rubbed, scraped, or over-stretched. If such neurocompression does exist, referrals should be made to appropriate medical professionals for an orthopedic work-up. What makes the bone-on-nerve pinched nerve theory so popular is that therapists viewing anatomy texts or cadavers can easily visualize how spinal nerves could become entrapped as they make their way through the bony little holes between vertebrae. For most of humankind, it is far easier to believe something we can see versus something invisible to the naked eye. Despite this human tendency, today’s touch therapist must understand that spinal joints and muscles have massive nociceptive and mechanoreceptive innervation that is profoundly affected by sustained compressional loading due to tension, trauma, and poor posture. While not clearly apparent, sensory receptors are the primary reason for client visits. T. Melzack and P. D.Wall,“Pain Mechanisms: A New Theory,” Science 150 (1965): 971. R. Melzack and P. D.Wall,“The Challenge of Pain,” (United Kingdom: Penguin, 2004), 35. North American Journal of Clinical Neurosurgery 15, no. 3 (2005): 269–88. V. Janda,“Treatment of chronic back pain,” J Man Med 6 (1992): 166–168. J. Mennell, Joint Pain, (Boston: Little Brown & Company, 1964), 224–259. A. M. Burt, Textbook of Neuroanatomy, (Philadelphia: WB Saunders, 1996), 311. R. F. McLain,“Mechanoreceptor endings in human cervical facet joints,” Spine 19 (1998):495–501.